UTComp’s UltraAnalytix system for fiberglass reinforced plastic (FRP) inspection is discussed in an article, Novel Inspection System Aligns FRP and Metallic Asset Management Approaches, published in the May/June 2017 issue of Inspectioneering Journal. The article, by UTComp president & CEO Geoff Clarkson, provides an overview of a systematic inspection approach for FRP that aligns FRP mechanical integrity results with those for metallic mechanical equipment. “Many operators with Fiberglass Reinforced Plastic (FRP) piping and vessels in their facilities desire the same quality of reporting and advice regarding FRP condition as they receive for their steel assets,” Clarkson writes in the article. 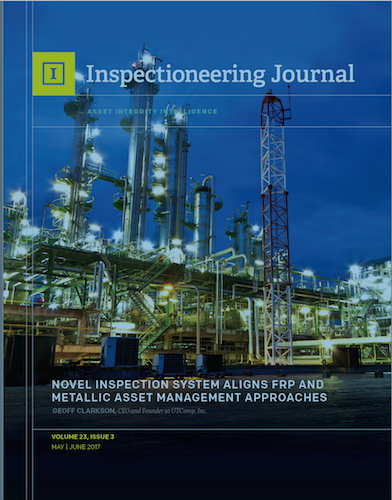 Read Novel Inspection System Aligns FRP and Metallic Asset Management Approaches and stay tuned for more information about UltraAnalytix inspection and performance to come in a future issue of Inspectioneering.